I get a lot of beauty product samples in gift bags and, for the most part, I try them all. It’s actually fun, expect for the occasional break out. My husband thinks I’m obsessed with my skin because my vanity table is filled with a variety of products. I won’t deny that I am adamant about using moisturizers and eye creams so, naturally, I was excited when I was asked to review a few of the products from Sanítas’ Skincare line. Based in Boulder, Co. Sanítas Skincare offers a variety of cleansers, toners, moisturizers, masks, and nutritional supplements that treat skin from the inside as well. It’s no surprise that Sanítas means good health in Latin because their products utilize substances already present in the skin to stimulate the natural healing process. 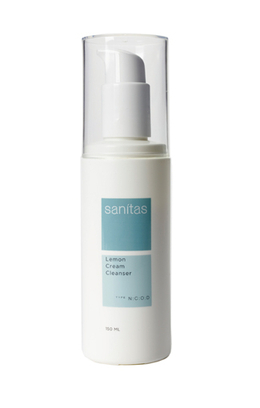 My routine begins with the Sanítas Lemon Cream Cleanser. The zesty lemon scent is a great way to start your day. This gentle cleanser exfoliates and hydrates the skin while removing impurities and excess oil. It contains lipophilic Vitamins C and E (in addition to hyaluronic acid & jojoba oil), which act as antioxidants to help protect, heal, and provide anti-aging benefits. I also use the cleanser at night because it does a great job of removing make-up. For $29 it really is a bargain because you only need two small squirts to clean your face effectively. 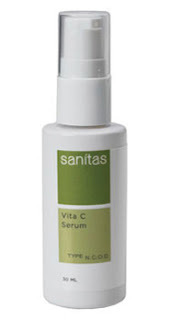 Once cleansing is complete I apply the Sanítas Vita C Serum. The product contains C-Lipo, which is a powerful lipophilic form of Vitamin C that aids in restoring the skin’s youthful tone and elasticity by stimulating collagen and moisture factor production. I was happy to find that it also helps lighten hyper pigmentation. I also like to apply the Vita C Serum before bed for added benefit. The next step in the routine is the application of the Sanítas Moisture Mist. This hydrating spray leaves your skin feeling refreshed while stimulating immunity and boosting UV defense. It also enhances the absorption of moisturizers. If you haven’t tried a hydrating spray before I highly recommend it. They really are a treat for your face and since Sanítas Moisture Mist is non-allergenic, non-comedogenic, and sells for $18 it’s a good product to start with. 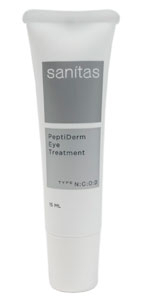 After the moisture mist I apply Sanítas PeptiDerm Eye Treatment. The product is formulated with high concentrations of peptides and nutrients that support collagen production at the cellular level. It also helps reduce redness and puffiness, in addition to reducing the appearance of fine lines and wrinkles around the eyes. Since the skin around your eyes is delicate and can easily give away your age I am a stickler about using eye cream on a daily basis and I have to say that this one works quite well. Narrative by Nikki Neil, Photos courtesy of Sanítas.